Introducing DiGiGrid M – the musician’s choice. Perfect for use at home, in the studio, or in any musical environment, this stylish unit boasts two inputs and two outputs. It is super-easy to use: just plug and play, with simultaneous monitoring and recording capabilities through two dedicated I/O. Input 1 is a dedicated mic/line input, while input 2 is instrument/ line, allowing many musical combinations. 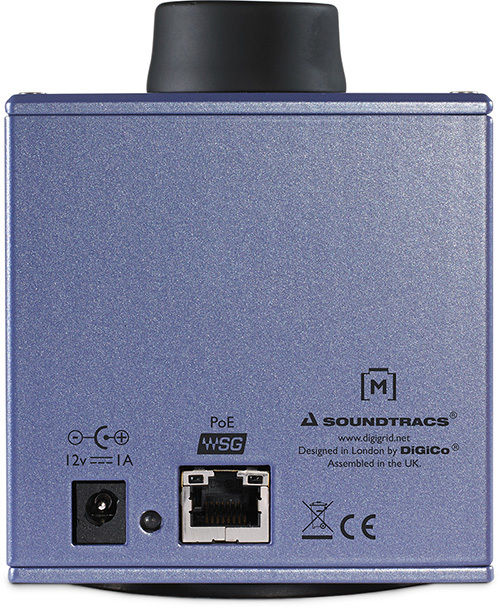 Audio capture is also of the highest order thanks to DiGiGrid M’s top-quality converters and industry-proven mic preamps. When you listen back, a dedicated high-powered headphone output guarantees a classic warm analog control path in a fun and easy-to-use package. Should you need to expand, the possibilities are practically endless: DiGiGrid M integrates seamlessly with any other DiGiGrid product to provide you with mountains of extra I/O and overall functionality, all connectible through the device’s Cat 5e/Cat 6 SoundGrid network port. 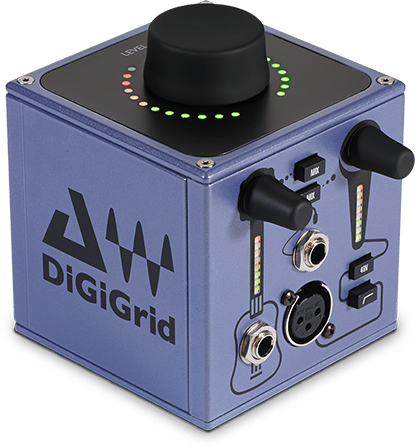 DiGiGrid M benefits from a non-slip base and an optional mic-stand adaptor plate. It is powered by a twist-lock 12V DC power supply (provided as standard) or Power-over-Ethernet (PoE) for maximum flexibility and easy setup, anywhere you want it. With just one simple Ethernet connection to your Mac or PC, you now have a simple standalone high-quality audio interface that you can use with any DAW. Use DiGiGrid M in conjunction with the DiGiGrid S switch, you will easily be able to network up to four DiGiGrid devices, up to 75 meters/245 feet apart. They can even be connected to multiple computers and DAWs at the same time. Check out DiGiGrid Q if you need an extra high-powered headphone amplifier, and DiGiGrid D for more I/O from the same series. And as your system grows, you can connect more I/O and DSP from the rack-mounted series.